Week 23 Fantasy Basketball lineup advice based on schedule: It's playoff time! What a difference a week makes! 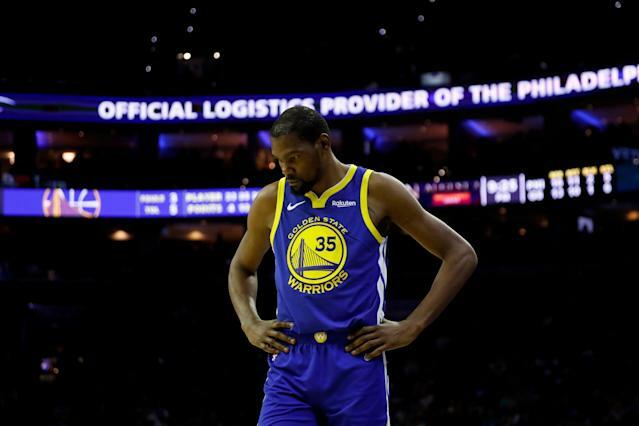 If your league started the playoffs last week, the teams that owned key Golden State players got punished, with the Warriors playing just two games, and Kevin Durant not playing at all. If you start the playoffs in Week 23 however, those same teams with key Warriors are at a huge advantage, with them playing five games. Meanwhile two fantasy relevant teams, the Nets and Magic, have just two games, in a week where 16 teams have four games. The good news for you if you rely on Brooklyn or Orlando players is that if you do play in a head-to-head league with playoffs, you have fewer opponents to compete with on the waiver wire. … and we have to begin with Kevin Durant. He missed Saturday night’s game against the Thunder, but before the game, coach Steve Kerr said that he expects Durant to play Monday against the Spurs. But certainly in a five-game week there’s always a risk of a player getting a maintenance day, and Durant would be a primary choice for that option. Aside from that, there’s little else that changes. You don’t need me to tell you to start Steph Curry, Klay Thompson, DeMarcus Cousins or Draymond Green. The one borderline player might be Andre Iguodala — at least, he gets enough minutes to be a consideration. But even with Durant out the last two games, he’s only tallied a combined 27.7 Yahoo fantasy points. In a week where there are so many four-game players, Iguodala’s five games don’t stand out. … this week, even D’Angelo Russell, who is averaging 38 Yahoo points over his last 15 games, as a lot of his high-end games came earlier in that span. The strongest counter-argument is that the Nets’ two games come against defensive sieves Sacramento and the Lakers. But all it takes is for Russell (or Spencer Dinwiddie if you’re feeling especially frisky) to be off on his shot for one of those two games for that decision to blow up in your face. … with the Magic, at least in the case of Nikola Vucevic. Vucevic is on fire right now, averaging 45 Yahoo fantasy points per game over his last 15. Making matters more difficult is that replacement value at his center position is necessarily lower, with fewer players qualifying there. The Magic have two home games this week against non-contenders New Orleans and Memphis on Wednesday and Friday, and sit one game behind the Heat for the final Eastern Conference playoff spot. They need this game, so there’s no doubt that he plays if he’s healthy. I would, however, bench my remaining Magic, including Aaron Gordon, D.J. Augustin, and Evan Fournier. My playoffs start in Week 23, and my main guy is James Harden. You’ll need to watch his status carefully on Sunday and for Week 23, after he suffered a cervical strain Friday against the Suns. The Rockets enter Sunday’s play a game ahead of Portland for the third seed in the West, and 1.5 games ahead of Oklahoma City. One might argue that they’d be better off settling into the fourth seed to avoid the surging Spurs, winners of eight in a row, but I doubt that the Rockets have that mindset. He’s such a unique player that it’s difficult to pinpoint someone who would benefit without him, but I suppose if anyone, it’s Chris Paul getting more shots. … this week, but just lost Malcolm Brogdon on Friday night for six-to-eight weeks with a plantar fascia tear. 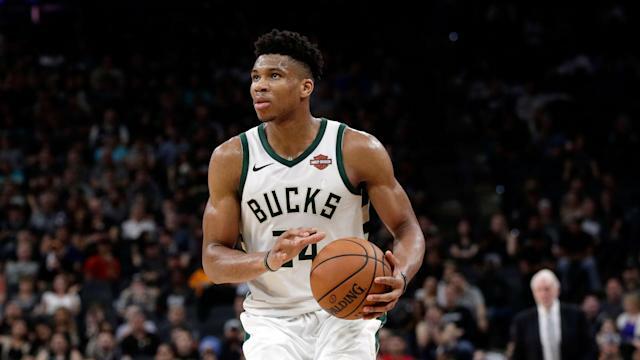 After Brogdon got hurt Friday against the Heat, the Bucks leaned more on their starters to complete their comeback win. In the long run however, I see Tony Snell and Pat Connaughton adding more minutes than anyone else as a result of Brogdon’s absence. He missed a game on March 2, one that Eric Bledsoe also missed, and in that game Connaughton played 36 minutes and Snell played 27. Generally speaking, the Bucks might start becoming a threat to invoke player maintenance down the stretch. They hold a three-game lead over the Raptors in the East, and are 4.5 games over the Warriors to get the first-overall seed for home court advantage. This week’s schedule actually invites them to go that route, too — they have back-to-backs against the Lakers and Cavs on Tuesday and Wednesday, with the second of those two games on the road. Their remaining two games are at home against the Heat and the Cavs again on Sunday. … and a demonstration of past behavior — to suggest their top players might not play all four of their games this week. At three games back of the Bucks, they’re *just* close enough to have a fighting chance to catch them, but they are also five additional games ahead of the Sixers for the second seed. Kyle Lowry missed Thursday’s win over the Lakers with an ankle injury and is doubtful for Sunday. Serge Ibaka will have one more game of his three-game suspension to serve next week. Kawhi Leonard remains great when he plays, but he so infrequently plays more than two games in a row without sitting a game out. The safest Raptor to play right now is Pascal Siakam, who played 39 minutes Thursday with Ibaka out. By comparison, Marc Gasol’s playing time inched up three more minutes to 26, over his regular 23. The good news for the Raptors is that their schedule is spread out, with games Monday, Wednesday, Friday and Sunday — though that Monday game will be the second of a back-to-back. … might have received a gut punch Saturday night when Westbrook received his 16th technical foul of the season, which triggers a one-game suspension. There’s still a chance, however, that one of his technicals could be rescinded by the NBA. But if that doesn’t happen, he might have to serve that suspension this week, in a three-game week. The Thunder host the Heat and Raptors on Monday and Wednesday before traveling to Toronto for a rematch with the Raptors on Friday. If he were to sit, even more of the burden would fall on Paul George, and Dennis Schroder would also be asked to pick up some of the slack. … for your playoff week, after he injured his left knee in Saturday’s loss to the Spurs. He’s set for an MRI on Sunday, but even if that comes back clean it seems unlikely that he’d get his full run of minutes Monday at home against the Pacers. Perhaps Rodney Hood would be asked to carry more of the load, though he isn’t necessarily a one-for-one swap, as Seth Curry could also fit into that picture. Or, the Blazers could simply do what they did on Saturday and lean even more on Damian Lillard and Jusuf Nurkic than they normally do. The Blazers have just three games this week. … after a five-game absence, though he’s been on a minutes restriction over his first two games back. The Kings had a nice run to try to earn a playoff spot, but they’ve faltered lately to fall six games back of the Clippers for the 8-seed. I think that they’ll want to work Bagley back up just to give him valuable developmental time, but there’s always that risk with a prized rookie (witness Luka Doncic sitting out for the Mavs on Saturday night). That schedule is pretty sweet for the Kings this week, with home games against Brooklyn, Dallas and Phoenix before they go on the road to face the faltering Lakers on Sunday. I’d start Buddy Hield, De’Aaron Fox and Harrison Barnes with confidence this week, and probably Willie Cauley-Stein too, though if Bagley’s minutes go back up then Cauley-Stein could lose out. Bagley is the tough decision this week, as it requires a leap of faith. Sunday’s home game against the Bulls could give us a clue of their intentions. … of the Black Knight from the Holy Grail, affirming that they are not dead yet despite having several limbs severed from their team. They’re 6-4 in their last 10 and three games out of the final playoff spot in the East. They also play at such a pace and aversion to defense that they are producing some fantasy friendly games, both for themselves and their opponents. Bradley Beal isn’t merely a start — he’s been a fantasy star ever since John Wall’s injury, averaging 53 Yahoo fantasy points per game over his last 15 games. After that, the Wizards have balanced their production fairly evenly among four players that have averaged about 28 Yahoo points per game: Trevor Ariza, Jabari Parker, Bobby Portis and Tomas Satoransky. With four games this week, that’s really valuable, and you can see why we’re trying to dissuade you from using the likes of D’Angelo Russell or Aaron Gordon. Even if the Washington Four were to just chime in at 25 fantasy points per game, that’s still at 100 for the week, for a far better result unless you have a games cap. Good luck trying to find similar opportunities for your playoff week in Week 23, and moving one step closer to shipping the Championship!